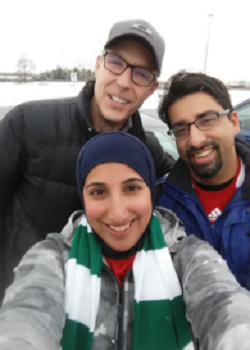 Shireen Ahmed is as versatile, unselfish and impactful in her line of work as one of her favorite soccer players, French superstar Louisa Necib, is in hers. Ahmed is too humble to give herself compliments similar to those she bestows on Necib, a two-time UEFA Champions League winner and former French league Player of the Year. She won’t call herself close to perfect, but Ahmed’s passion and persistence allow her to nonetheless perform at an elite level. She is a writer, an activist, a public speaker, an advocate, a community organizer, a coach, a mentor and an athlete. She runs her own site, ShireenAhmed.com; she has done speaking engagements all over North America; and she has been published by Sports Illustrated, Huffington Post, espnW, VICE Sports, Islamic Monthly and Muslim Voices, to name a few. This week, Ahmed will be a featured speaker at a conference titled “Athletes as Activists: Lessons from Black Lives Matter and Beyond” hosted by the University of Texas at Austin. UMMAH SPORTS: What is your scope of work right now? What do you do and what projects are you working on? SHIREEN AHMED: I am a freelance writer and sports activist. I write about and advocate for Muslim women and women of color in sport. I write about issues of intersectionality and the challenges and triumphs of those women. Very often I write about issue of social justice in sport. Most of my writings are featured on my site (www.shireenahmed.com). I also dip into politics from time to time. At the moment, I coach a middle school girl’s team in soccer. 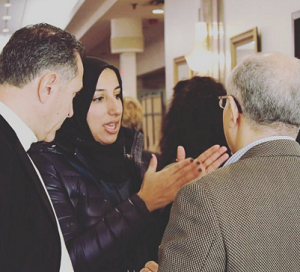 I am also working on a weekly program with Syrian refeugees in Canada. Football is a fantastic way to communicate. US: Where else can people read your writing? SA: My work has been published at FanSided, Sports Illustrated, Racialicious, Policy Mic, VICE Sports, Islamic Monthly, Soccer Politics / The Politics of Football, A Football Report, Huffington Post, Football Beyond Borders, International Museum of Women, Best Health Magazine, Aquila Style, Muslim Voices, Women Talk Sports, Footynions, espnW and Edge of Sports Radio. US: Talk about your athletic background. Soccer is clearly your main sport, but did you play others growing up? SA: I started playing soccer when I was five years old. I fell in love with it. I played a lot of different sports as a child. My parents encouraged me to try different things. I played ice hockey, volleyball, touch football, paddled, played badminton and squash and swam a lot. When I was in University I rowed crew after I stopped playing varsity soccer (I started wearing hijab and it wasn’t permitted on the pitch at the time). I never played basketball. I disliked it. But I married a basketball player, Alhumdullilah. Funny how that happens. US: What first drew you to soccer and sparked your love of that sport? SA: It made sense to me. It still does. It includes 22 people with very little equipment or fuss. Such a practical and wondrous game. I have always loved the teamwork and social aspect. It is pretty great to be part of a squad. They have your back. They enable you with terrific passes and encouragement. I tore my ACL a few years ago and my teammates carried me off the pitch — no question. There are unwritten rules of camaraderie. US: What other sports do you follow today aside from soccer? SA: I am Canadian so I love ice hockey. Particularly when our women’s national team plays. The whole country gets all excited. It’s pretty phenomenal. I watch NBA during the playoffs. I am a huge San Antonio Spurs fan. I love they way they play. In fact, they pass so beautifully sometimes that I feel like it is similar to soccer. My husband told me that is the way that basketball is meant to be played. But soccer occupies much of my heart and my head. US: Who are some of your favorite athletes to watch or to cover? SA: One of my favorites is Serena Williams, obviously. She is a phenomenal athlete and incredible woman. Lots of integrity and personality. Asisat Oshoala is a Nigerian footballer and a joy to watch. She has lightning speed and is still quite young. I am a little obsessed with Jeanne d’Arc Girubuntu these days. She is a cyclist from Rwanda. I am writing about her and she is incredibly exciting. I love, love, love Louisa Necib. I think she is as close to technically perfect on the pitch as I have ever seen. Of course I love Christine Sinclair (captain of Canada’s women’s soccer team) and Kadeisha Buchanan. I have a lot more, including Hajra Khan, a friend and a footballer from Pakistan. Of course there is Tim Duncan. Then there are Xavi and Iniesta. Love them so much. And Ronaldinho and Neymar Jr. bring such a tremendous and infectious passion to the pitch. My all-time favorite male player is Zinedine Zidane, for obvious reasons. One of the women I respect so much is a Canadian oarswomen named Silken Laumann. She is probably one the greatest athletes this country has produced. She has won World titles and Olympic golds. She had a horrible accident in her skull about six weeks before the Olympics — another boat crashed into her and went through her leg. She still won bronze a few weeks later. She has a dedication and a drive beyond anything I’ve ever seen. I read her memoir. It was incredible. US: How did you turn your interest in sports into something you could do professionally? Was it something you set out to do, or did you just kind of fall into it? SA: I fell into it. I started blogging. It kind of took off from there. I didn’t think there would be a place for me. I am a Muslim woman of color. There aren’t a tremendous amount in sportswriting. US: What is your typical day like? SA: I wake up for Fajr, try to get 30 minutes more of sleep. Then start hollering at my kids to get ready quickly. I make lunches and drop my kids off to school. I come home or go to a cafe to write — depending on the schedule — and some days I got to the gym. I answer emails and spend my morning on social media scouring stories and updates. I do most phone or Skype interviews in the morning as well. During this time, I cater to my cat for whatever she wants. I get groceries, prep dinner and pretend to clean up a little. I pick up the kids and then feed them, and by 5:30 p.m. I am running out the door driving a kid to practice or picking them up or something. At the moment, I run a mid-week program for Syrian refugees. I keep busy. Very normal banal “Mom” stuff. And I tweet. A lot. On the weekends, I am on the sidelines of the pitch or courtside at various tournaments of my kids. Tuesdays are match days for me. I play every Tuesday night with my own soccer team. I love it. I sneak in a coffee date with friends when possible. And I chat with my Dad everyday, Alhumdullilah. My Mom and I text but my Dad and I talk. It’s a routine. We also compete for who calls who first. And we like to tease each other. If I can’t reach him I will make a big production out of it and leave five messages on different voicemails and send 10 dramatic texts. He enjoys that, Alhumdullilah. US: For all the things you do, how often are you able to do them? How often do you post on your blog? How frequently do you do speaking engagements? SA: I blog almost everyday. Stories and things I find relevant to women in sports. And things I like. I do conferences, events and speak whenever it fits into my family’s schedule and I always check in with my husband because logistics are very important in my house. Six different people with six different priorities and schedules. US: What are some of the most memorable experiences you’ve had in this line of work? SA: On one trip to Washington D.C., I was invited by Brian Dooley from Human Rights First to sit on a panel with Olympic diver Greg Louganis, veteran sportswriter Christine Brennan, and sports and disability activist Eli Wolff. The next day, I met my mentor Dave Zirin and was on his radio show. I was on cloud nine the entire time. Because most of my work is online, I don’t always get to meet my colleagues or editors. When I finally do, it’s fun. I attended a conference last year at Duke University on the Futures of Women’s Soccer that was organized by one of my favorite Twitter people, Laurent Dubois, and Josh Nadel. All the panelists were women. I met a few former U.S. women’s national team players as well. It was surreal. US: What is your favorite part of what you do? I don’t speak for anyone except myself but it means a lot when people can relate to what I am writing. US: What is your least favorite, or the most challenging aspect of it? SA: My least favorite part is obviously getting online abuse. As a woman, it is very common in media. But as an identifiable Muslimah and WoC, I get a bevy of hatred rooted in racism, misogyny and gendered Islamophobia. Some of the comments have been violent. Particularly those when I criticize systems of sexism in sport. I try not to read the comments but I am always to eager to know public reactions to my work. My Mom always tells me she loves what I have done, and that is helpful and amazing. But I have realized that really sincere discussion of my pieces don’t happen in the comments section. US: What is your take on FIBA’s “anti-hijab” rule, as well as other sports such as soccer and weightlifting that have only recently allowed hijab headscarves during competition? SA: It is a very political and bureaucratic (read: vacuous) process. It’s only function is to exclude players from the game. It not only affects Muslim women but the ban affects Sikh men as well. Wearing turbans is not permissible — neither is wearing a kippa. So you have automatically rejected hundreds of thousands of players from specific communities. It is incredibly frustrating because there is no actual evidence that wearing a headcover of any kind is dangerous to the player or opponents. Important to note that the NCAA — which produces some of the top basketball players in the world — does not have a hijab ban. They self-govern and do not feel it has any merit. Which makes this all the more nonsensical. The FIBA ban is in place because a room full of powerful (mostly White) men are not affected by it. And they don’t care about elevating and expanding the game. This is about power and politics. US: Are there other sports governing bodies that have been banning hijabs or otherwise discriminating against Muslim women that perhaps we aren’t talking about as much as basketball right now? SA: Not as much as FIBA at the moment. There are a lot of federations that do allow hijabs. Rowing, racquet sports, track and field, hockey, skiing, ice skating. Some federations, including weight lifting and martial arts, were challenged and they rescinded their bans. US: Do you think soccer will ever take off in the United States to the level that many think it can? SA: In North America, it already has — by women, though. SA: Born, raised and still practicing, Alhumdullilah. US:What draws you to the religion? SA: Islam is not just about performing spiritual actions daily. It is a way of life. A commitment to justice and to espouse characteristics of integrity. To not tolerate the oppression of others nor allow oneself to be oppressed. To be honest in your work. It also reminds me to be merciful to myself and other because God Almighty is the most Merciful. I respect so many other faiths and followers, but I feel something very pure about my own connection to Allah azzawajal. It’s for me. Beautiful things can manifest from this Goodness and Light and affect greater community. The way we act, the justice we fight for, our different roles. But I like being selfish about my own spiritual needs. It is OK to do that. US: Do you think prominent Muslim athletes have a duty to speak out on political or social issues related to Islam? SA: This is a really important question. Ideally, it would be fantastic for prominent Muslims athletes to voice their concerns and speak up injustices in Muslim communities. But I don’t judge people who aren’t comfortable being advocates or activists. Athletes are there primarily because of a skill set and a gift. That isn’t always public speaking or engaging in socio-political issues. There can be pressure for Muslim athletes to do this. Very recently, (U.S. Olympic fencer) Ibtihaj Muhammad spoke up against the political Islamophobia taking over the American presidential race. She pretty much called Trump a fascist. She doesn’t have to do that. But she has a platform. I will always respect athletes who use their fame and their ability to amplify issues for good. We have seen superstar footballer Frédéric Kanouté be very public about his pro-Palestine stance. He was fined for doing that. There are other players and athletes, including Bilqis Abdul-Qaadir, who speak up against racism and Islamophobia. Kareem Abdul-Jabbar writes a lot about his life and his love for his Faith. I wrote about this and I think it’s important to realize that Muslim athletes don’t divorce themselves from their religion. They focus on playing and competing. But they are still solid Muslims. Whether or not they choose to speak up about an issue, is up to them. If they don’t, they still deserve our respect. If they do, we must support them. US: Do you think Muslims who work in media and communications can help change the way people view Muslims and Islam around the world? If so, how can they do that? SA: Absolutely. I think that Muslims can contribute in circles and provide a different lens by which to view a certain issue. Sharing opinions and different perspectives in editorial rooms, conversations, academic panels and everything else is so crucial. Particularly in my field, sportswriting, there are so few Muslim women doing this that my take on an event will often be drastically different and expressed differently than the usual White, cis, man. Fresh ideas and exploring various ways of looking at complex issues is a great thing for journalism. A diverse staff or team of contributors is beneficial. US: What are your career plans and goals moving forward? SA: I am writing a book, insha’Allah, and would love to continue doing what I am doing. I am aiming to do more public speaking. I have an opportunity to reach people through my work. People who might have never heard from a Muslim woman before. It baffles me every time that happens but it happens a lot more than we would think. I would also like to work more with Muslim communities and encourage them to offer as much space and facility for girls as they do for boys. There are a lot of budding Muslimah athletes out there, but they go outside of our communities for development, support and encouragement. We need to change this. It would be nice to have a job that paid steadily — freelance work does not — so I could do some work with women in different countries around sport and development. I also want to go to law school, insha’Allah. That has always been a goal of mine. Right now, I just want to have less than 70 pairs of mismatched socks in my household. That would work too. Alhamdullilah — “Praise be to God.” A phrase that is used to thank God for the blessings He has given. masha’Allah — Arabic phrase that expresses appreciation, joy, praise, or thankfulness for an event or person that was just mentioned. Fajr — the obligatory prayer before sunrise. azzawajal — Mighty and the Majestic. A phrase used after referring to Allah.